What’s blue, wildly entertaining and brand-new? Blue Man Group’s show in Chicago! Learn why groups won’t want to miss this totally new creative experience that challenges the status quo. Blue Man Group Chicago is providing a new experience for student groups by unveiling brand-new content, presenting iconic moments, and creating a deeper connection between the audience and the Blue Men. There are new components a-plenty for student groups to enjoy within the show, such as commentary on culturally relevant themes like social media, connectivity and technology, original musical compositions, and more. In developing a new experience for Blue Man Group Chicago, the creative team not only looked at the world around them to see what new technology had emerged for inspiration—such as Virtual Reality—but also re-examined norms to update the Blue Man’s reaction to it. Students might even get the chance to join the Blue Men onstage for a musical collaboration with a percussion instrument inspired by French surrealist René Magritte. But don’t worry! Many of the well-loved and expected aspects of Blue Man Group’s shows are still present, and continue to surprise and entertain student groups. 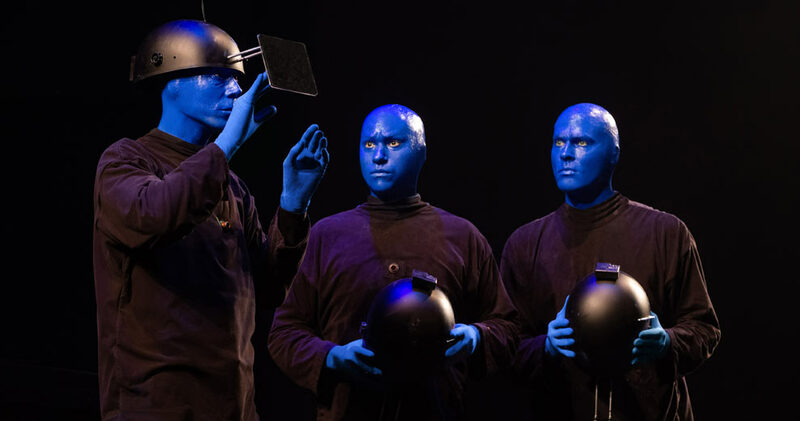 Experimentation is at the heart of Blue Man Group and part of every aspect of the show, from the Blue Men exploring paint for the first time on stage to the creative team picking up a pipe and wondering if an instrument can be made from it. These new materials within the Chicago show represent Blue Man Group’s commitment to its core equity to always try new things—an awesome lesson in creativity that can resonate with students of all kinds. Learn more at Blue Man Group. Courtesy of Blue Man Group. Photo courtesy of Blue Man Group/Daniel Boczarski.